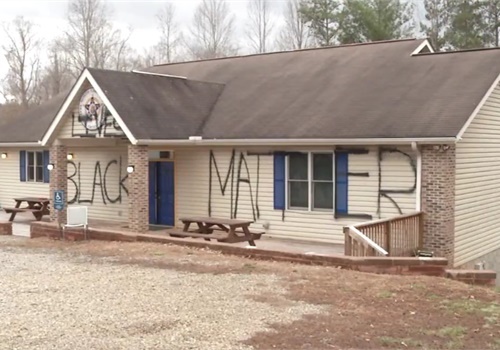 "Black Lives Matter" was spray-painted in large letters on the exterior of the Asheville, NC, Fraternal Order of Police's lodge on Monday. A police spokesperson also says the windows of an FOP van in the parking lot were broken out, and someone cut the wires to surveillance cameras, WLOS TV reports. Despite the cut wires, there is still surveillance footage of the suspect. The person in the video appears to be white, and is wearing a hoodie.